Hillary looks like she is going to win at least 4 states on the most recent version of Super Tuesday. Meanwhile, Trump is taking care of business on the Republican side of things as he looks likely to gain victories in each state except for Ohio, where Kasich will get what will probably he his only victory. One surprise during this big political night. People in Illinois getting in more votes than humanly possible. 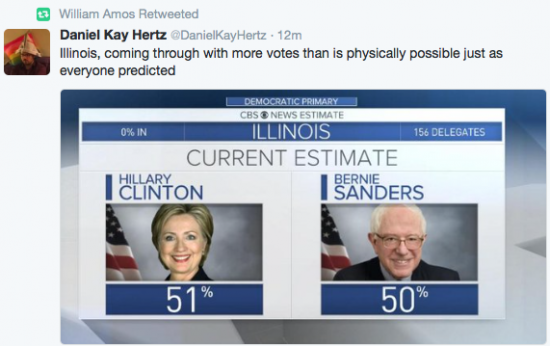 Sorry Bernie, when you’re taking on Hillary, 50% is less than half.